More Than Just A SAHM: Always a Pleasant Suprise! Such a pleasant surprise waking up on the morning with someone at the gate, "delivery po, hot pandesal." And what could be more surprising when a visit is done in the evening when I'm in my pyjamas and about to sleep? (no, not about to sleep. I'm a late sleeper and late riser person, just a dramatic speech) I hate waking up early but as the rules say, there is always an exemption.. certainly, you put a smile in my face. You always surprise me and I love you to bits. Mapa-umaga, tanghali at gabi. 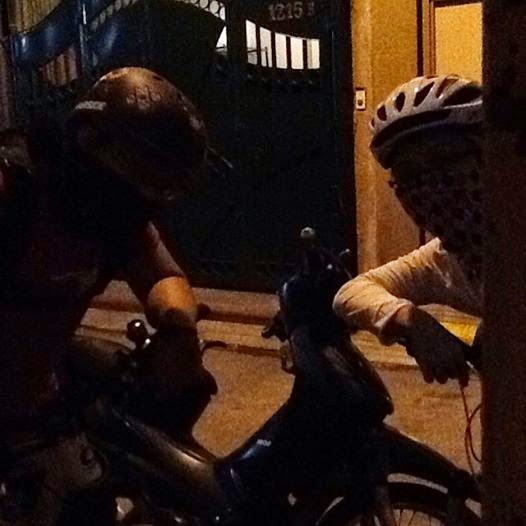 This morning is another pandesal-and-coffee day with these beautiful couple who biked their way to my place. I am amazed with how you spend and start your day.. a visit and another way of sweating out and burning calories. Such a healthy lifestyle! Definitely, another day to be thankful for, having early morning conversation and.. I wish I could join with you but I am more than happy that you find time to visit me home. You guys are amazing!